This past summer, I was introduced to Dailys cocktail pouches. They are perfect for freezing and taking to the pool. They are very convenient. I also use them as ice pouches for my shins! They conform perfectly after a long run. Don't worry, I do not drink the ones I use as ice pouches! Daily's recently came out with two limited edition seasonal beverages. Hard Cider and Spiced Sangria. I drink a ton of hot apple cider during the winter. This beverage is also has multiple uses. The second I feel a sniffle coming on, I whip up a batch, call Dr. Feel Good (Jack Daniels) and make myself a spiked cider. I had to give Daily's hard cider a test. It could save me so much time in the kitchen during the winter. Plus, I could have a stash on hand when I feel a little blue. I used one pouch to make two different variations. A hot version and a martini. The apple flavor in both is really good. They are not too strong, so you can add a little floater of your choice. Both Gabe and I really liked the hard cider pouch. With the martini, I made a cinnamon sugar rim and used lemon juice to adhere it. A slice of an apple and a couple of shakes in my martini shaker and you have an instant spiced apple martini. For this drink, I would put a little floater of apple vodka and you have a Jack Frost approved appletini. For the hot version, I put 8oz into a measuring cup, microwaved for 2 minutes and poured into a coffee mug, included a stick of cinnamon and voila - spiked apple cider. As hard as it is for me to admit - it is as good as the apple cider I make all day long. Thank you for saving me time and a kitchen mess Dailys! Now for the giveaway. I want you to tell me how you like your apple cider. Do you spike it? Do you drink it in a special mug? 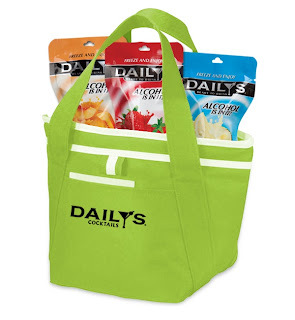 I will select three winners (21+ only of course) to win a Daily’s insulated lunch tote. 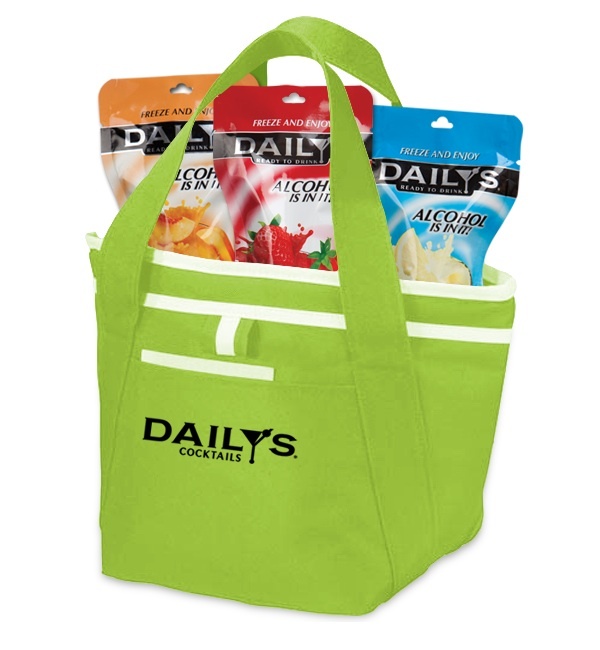 Disclosure: I was given a $10 Walmart gift card to purchase several flavors of Dailys pouches. All opinions are 100% mine and not influenced in any way. I love Dailys! Can't wait to try the cider! looks delish! It's sooo good. I got the spiced sangria too but haven't tried that yet. I may freeze that one. Me too girl!! With a drizzle of caramel too! You know, I have only had cold apple cider once. I always think of it as a winter drink. I loved the martini I made last night though! I love cider in all forms, but hot spiced cider, spiked just enough to create some extra warming, is perfect. I have a big pink mug shaped like a flower that I love to use for hot drinks. It's not very fall-ish, but it's pretty. Megan, you would love this then. It is delicately spiked, perfect when you have a cold coming on! Not enough to give you a buzz but enough to help the sniffles :)My favorite mug came from Cafe Du Monde in New Orleans! Oooh, I want to try that martini! It's so good Jen! The cinnamon sugar rim is a must. I can't wait to try those! I love apple cider. Hot or cold! That martini with the cinnamon sugar rim looks amazing!! I would love to try out the apple cider!